The first option under your keyword is “Google Search.” Selecting this option will, as you could probably guess, cause your browser to open a new tab and perform a Google search for the keyword term you chose. For me this is very handy especially working in any kind of niche field where you may not know what results a particular search will pull up. It is also useful to quickly see if you are already in the top 3 paid search results, or top 10 organic results for that search term. 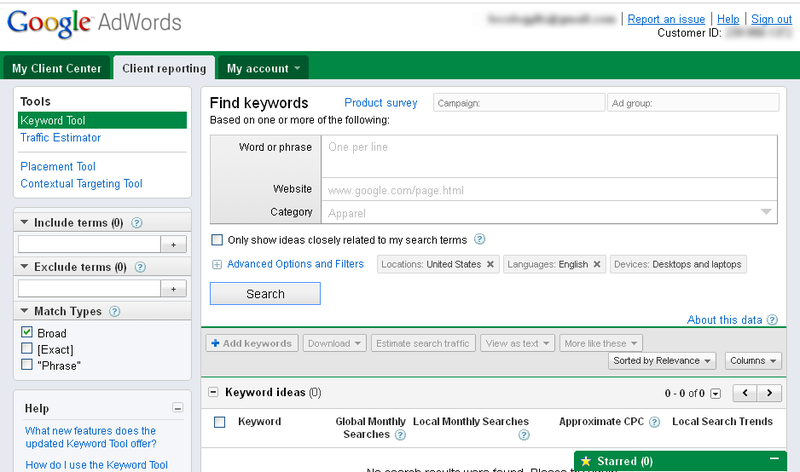 I wonder if a keyword I am bidding on shows up after clicking on this will count as an “impression” or not in AdWords. We’ll see. 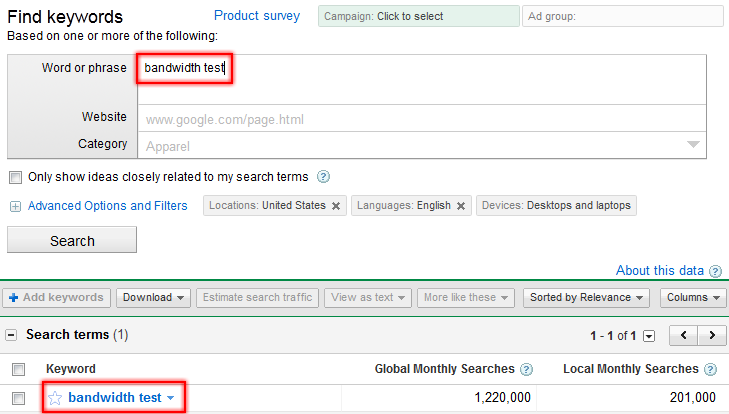 The next option is “Google Insights for Search.” This option will open a new tab on your browser with the Insights data for the keyword term or phrase. 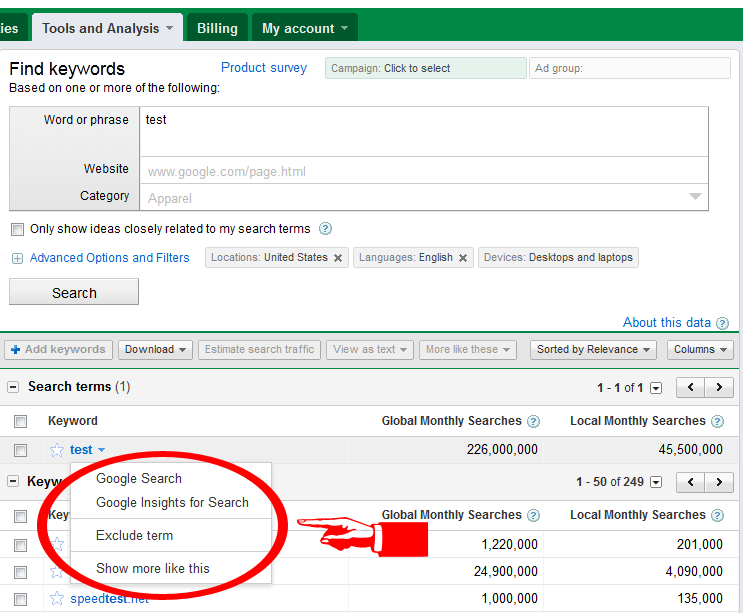 Google Insights is a great option to have because you can easily see if the term in question has any kind of seasonal results. It will also give you a quick view of the top searches that are closely (most of the time) related to your search, as well as a list of searches that are rising in popularity. 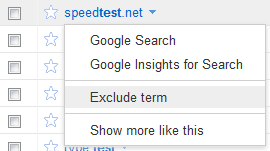 Option number 3 in the new drop-down is “Exclude term.” For those not familiar with this feature, let me brief you. 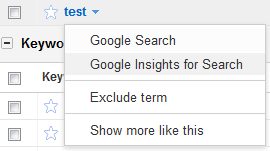 If you are doing keyword research, and you are seeing words that just don’t apply to your search, you can add them to the “Exclude terms” list on the left side of the page. That’s what this option does for you, without making you type it in by hand. While this won’t do anything to eliminate large sets of keywords in that list, it will keep that excluded term in there for future keyword research you do, as long as you don’t refresh the page. 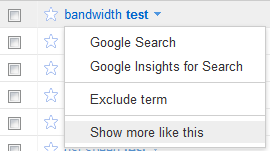 The final option in the drop-down menu is “Show more like this.” This option replaces your current search term, or terms, with the keyword you just selected. So if you were doing a search on more than one word or phrase, and you select this option, your phrases will be replaced with just the one you selected. Very useful for if you find a keyword that you didn’t think of before, and you want to see if there are others like it that you also did not think of. Google also changed the Page Size (amount of keywords shown on a page) and Pagination user interface for the Next / Previous page functions. They removed the paginated navigation from the bottom of the pages and placed it at the top. The “Go to Page (##)” feature has also disappeared. Here's what the buttons looked like before the change. They were at the bottom of the results. 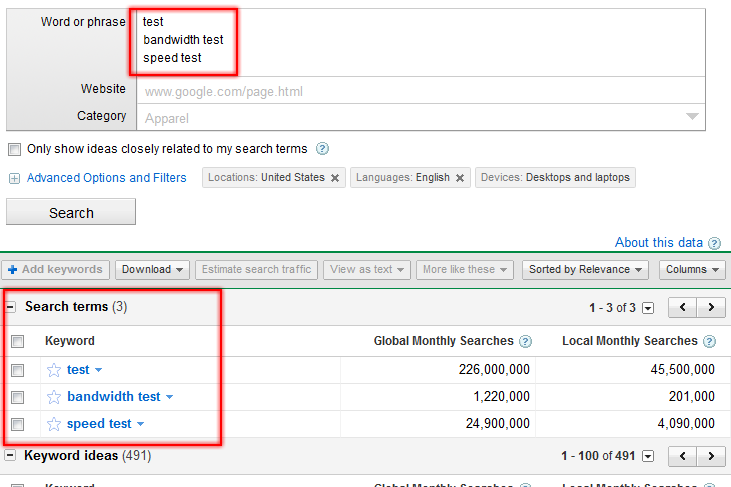 Another new option is next to the “Estimate search traffic” button. It’s named “View as text.” This option is grayed out and not clickable until you select 1 or more keywords, but either checking them or clicking the star. 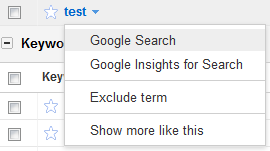 Once you’ve selected a keyword, you can now click the “View as text” button. Clicking it will reveal 2 options: Starred, and Selected, with the number corresponding to the number of keywords you selected. 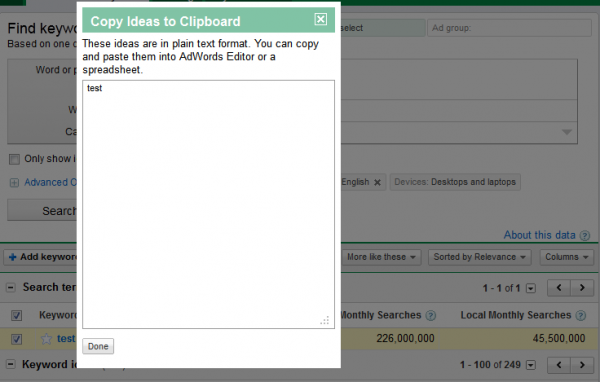 Clicking on one of the options will bring up a light box with a plain text list of the keywords you selected, in case you want to copy them to your clipboard and edit them in your notepad or something. Lightbox with the plain text list of keyword you selected. The next button over is the “More like these” button. This works in much the same was as the new “Show more like this” option under each keyword, except with this button you can check multiple keywords, and it’ll replace your list of words or phrases with the newly checked ones. Is the Google AdWords Keyword Tool More Accurate? Although we do not have any screen captures of recent keyword results to compare the new version to, it appears as though the results might be more accurate in returning keywords related to your original query’s theme. Nothing scientific in this discovery, just considering several recent searches to what we are seeing now. Go take a look and play around with the new features. I find them very helpful, I hope you do as well! 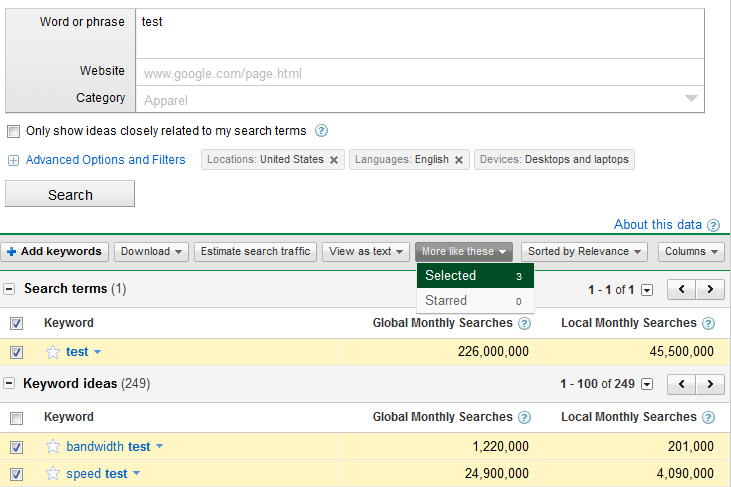 Google should know that a better keyword tool means more keywords added in adwords. 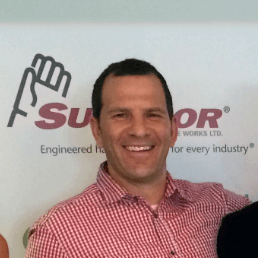 I hope they do their best to get the keyword tool better an better. These new features are a good start! it seems, that google eliminate the “more like these” button on it´s keywordtool interface. Can you give me a hint where I can find it? It is not on the place like above described from you. Good catch, it looks like since the design change came out that option was removed, I am not seeing it anymore either. I’ll keep poking around and if I find it, I’ll let you know. thx for the fast answer. It would be super, if you can find the “more like these” button.